Some of these are falling in your yard. I have been trying to keep them picked up so you guys aren’t tripping over them. Next harvest, if you get to them before I do, have at it. You can relive your childhood with the rock and a hammer or try out my nutcracker. I cracked some extras yesterday and put them in my oatmeal this morning. 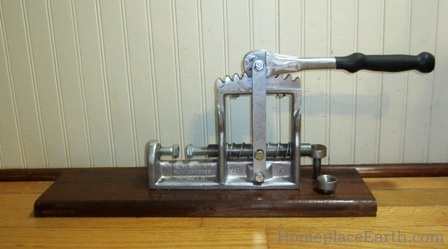 I second your recommendation of the original Master Nut Cracker over the Duke knock-offs. It has superior materials as well as finish. I crack about 250# of nuts per year and have used a number of different crackers over the years including a borrowed Duke. Gerald Gardner’s Master Nut Cracker is a pleasure to use. I do not mind spending a little more for quality and like sending my money to the original designer. Frank Wright, Spoonmaker. Lanesboro, Minnesota. Frank, thanks for posting your comment. I was hoping someone else with experience would chime in. 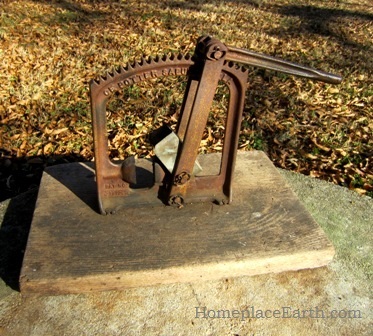 The fact that you’ve used both the Duke and the Master Nut Cracker makes your thoughts all the more valuable. I have broken two of the knock-off types. My local store replaced the first and gave me store credit for the second so it all worked out but I do plan on purchasing one that will hold up. Thanks posting a good source. Vicky, I’m sorry for your experience, but thanks for telling us that. I hadn’t seen any of these nutcrackers in local stores and we don’t know how they do until we hear from folks who have tried them. Good timing on the Nut cracker post as we go into Nutcracker season!! When I was a kid a big mechanized black walnut huller would travel from town to town. When it came to Fayetteville, we would gather up as many black walnuts as we could (there are lots in the Arkansas Ozarks), and take them in. The machine would take off all of the outer stuff, then they would weigh the nuts, which were still in the shell. They would then pay us so much per pound. If we made $5-10 we thought that was great! I don’t know if that still happens around the country, but it was a fun thing to do. Molly, I have never heard of something like that, but I can just imagine that it sent all the kids scrambling for walnuts and spending money. If it doesn’t still happen, it should. Our non-seasonal way for quick cash was to pick up pop bottles along the road when I was growing up in Ohio. Each bottle was worth 2 cents and we could turn them in at the local mom and pop grocery store. Of course, while we were there we could get bubble gum for a penny and a popsicle for a nickle. I agree with using the Master cracker and watching out for the cheap copy! I actually work for a company that sells the American Master Cracker. We get them straight from the gentleman that manufactures them. We have a video that shows the 2 different ones side by side. The investment in one like you have is well worth it! We have numerous calls every nut season with people wanting to make sure they get the American made, esp when they are browsing eBay listings. Out of all that we sell (often times faster than we can get them in) I have not seen any returned and only have to replace 2 of the wooden boards.